Is the Ariens Path-Pro right for you? This will be a detailed review of the Path-Pro 208EC Model 938033. This new snow thrower is rated as a contractor model, but many home owners will want to consider it. I will also go over the differences of the other four new models: The 938030, 938034, 938031, and 938032. 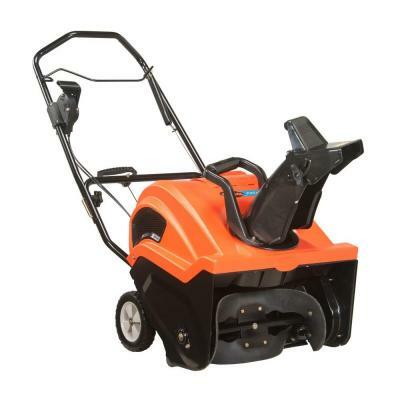 My goal here is to help you decide if the Ariens is the best for you. I’ll tell you what I like, what I don’t like and how it compares to the other brands. Settle into your easy chair, this will be a long review. All the information in this article is based on my experience as a snow contractor, not marketing hype given to me by Ariens. Yes, there is a video or two at the end of this review. Many snow plow contractors like to have a single stage snow thrower with them in the back of their truck. They use it for cleanups, sidewalks and pathways where their large equipment won’t fit. These snow throwers get a lot of use and abuse. They are thrown into the truck, slammed on the ground and left out in the back of the truck exposed to all the snow, salt and ice of a typical snow storm. Besides the abuse these snow throwers get more time on them cleaning a typical apartment complex once than you as a homeowner will put on one in 2 to 3 years. For years the Toro Power Clear snow throwers were the tool of choice for professional contractors. But with some Toro models costing over $850 professional contractors have been looking elsewhere for a dependable machine. So Ariens decided to get back into the single stage snow thrower market. The new Ariens Path-Pro’s boast larger motors, lighter weight and costs up to 20% less for the same quality as other brands. I predict you will see a lot more orange than red in the back of your local plow truck in years to come. I review products differently than Consumer Reports or your favorite home improvement blog. I don’t rate snow blowers as “best buys” or that you will “feel good” owning a certain brand. My goal is to match you to the best snow blower…for you. 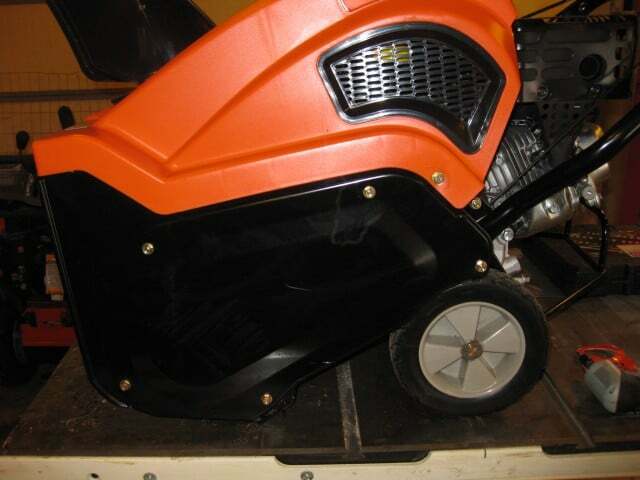 I know that a manufacture has designed a snow blower for you but it can be very hard for you to decide which one is the best for your property and budget. So each year manufactures offer to send me snow blowers to review and I select only 2 or 3. Why? First, I review snow blowers the manufactures and I feel fit the readers of this site. This allows me to help you wade through the 228 different snow blowers on the market and find the best snow blower for you. Second, I am the only one doing the reviews. I don’t have a “staff” of editors. I don’t have the time to “test” every snow blower on the market. Third, There are not that many changes to to snow blowers from year to year. Engines change, chute controls, etc., but I don’t need to review every one each year. Last year it was Husqvarna, this year it’s Ariens, next year – it depends on what you want. Ariens sent me this new Path-Pro Model 938033 and a Sno-Thro Deluxe 28 Model 921030 with the new Auto-Turn for this season. I want to thank Angela Raddant from Ariens, Mary Lyn Wininger from Ariens and BARSTOW STREET AUTO SERVICE, Eau Claire, WI for working out the details and getting the snow blowers to me. Because the Path-Pro has the engine exposed the snow thrower will be a little louder when using it, but no more so than a 24 inch two-stage snow blower. The new Ariens Path Pro takes a decidedly different direction in maintenance and all normal service points are easy to get at. The spark plug, carb, oil drain . The auger belt cover can be quickly removed with sockets and in a pinch with a pliers or multi-tool. The new Path-Pro’s cost less than the competition. In fact, the new Path-Pro’s cost less than the residential models from other brands. In some cases the Path Pro costs a lot less. In my opinion the quality is not less though. Less plastic – more metal – less cost – go figure! They represent a great value for both the homeowner and snow contractor. The Path-Pro’s auger uses nuts and bolts to mount the paddles. This is a minor feature for a homeowner, but for a contractor it is a BIG plus. Why is that important? As a homeowner you may never need to replace the front rubber paddles. The front paddles are as strong as car tires and will last you years. But a contractor will go through a set every season or two so they need to be able to efficiently replace them. Many of the homeowner models use rubber paddles are riveted to the augers. Other brands use a self-tapping bolt to mount the paddles. Riveted paddles take hours to replace and self-tapping bolts have a tendency to rust into the support and break off when you go to remove them. With the Path-Pro, if the nuts and bolt rust up you can grind them off without ruining the front auger mounts. Even the paddle mounts are bolted onto the auger shaft. You can hit something hard and rebuild the front assembly instead of having to buy a completely new auger/paddle assembly. The Path-Pro uses a grooved belt instead of a v-belt. V-belts have been around for a long time. They provide a good transfer of power but they don’t like to get wet. Why is that important? For years single stage snow throwers used small, lightweight under-powered engines. But over the last few years everyone has upgraded the power and now they are now pushing the limits of a 3L drive belt. Ariens again took a different path here and uses a grooved drive belt that is strong enough to last years and deliver all the power a 208 cc motor can deliver without slipping. Metal cover on the drive belt: Why is that important? I know all the other manufactures who read this will tell you this is a minor point, but for a contractor it is important. The auger drive belt cover on the Ariens is metal because Ariens knows that the least experienced operator always gets to clean the paths and walkways. (The experienced operator gets to drive the plow truck) The inexperienced operator is going to bang the snow thrower into posts, landscaping, foundations and steps. The operator is going to throw the snow thrower into the truck and drop it when they are taking it out. The typical homeowner version uses a plastic cover and that inexperienced operator will probably break the cover in minutes. 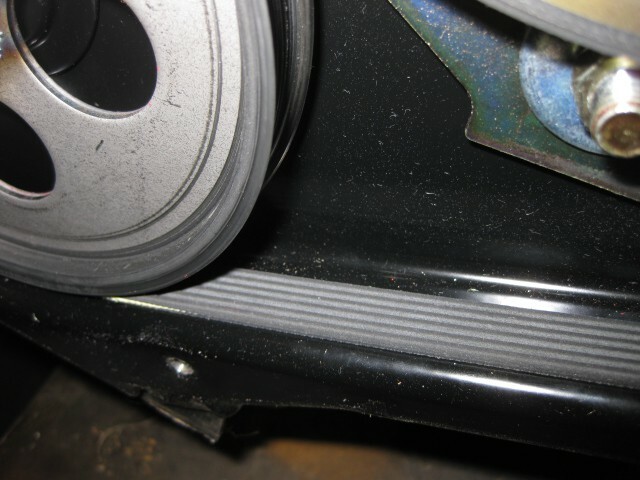 Breaking the cover or having cracks in it allows moisture into the belt area which will make the drive belt slip. The metal cover will put up with a lot more abuse. The metal cover on the drive belt is also designed so you can remove the bolts without any special wrenches. Why is that important? The inexperienced operator is also going to find stuff in the snow. A garden hose or entrance mat the renter forgot to pick up are common surprises. When he manages to get the welcome mat stuck in the snow thrower and he burns up the drive belt it can easily be changed right there. No need to bring the snow thrower back to the shop for repair. Of course a socket is best, but an open-end wrench, pliers or even a multi-tool can be used in a pinch to remove the cover. Most experienced snow contractors always carry extra belts, spark plugs, carb cleaner, shear pins and tools with them. 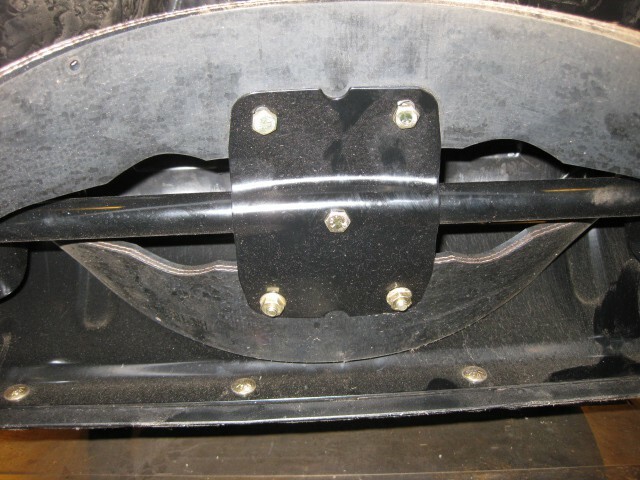 Axle reinforcement: A bolted in brace protects the frame. Why is that important? Contractors are constantly taking these snow throwers out of the back of the pickup and the inexperienced operators will drop them on the ground. They will jerk them over steps and curbs. The extra bracing will keep the frame from bending and the wheels running straight. 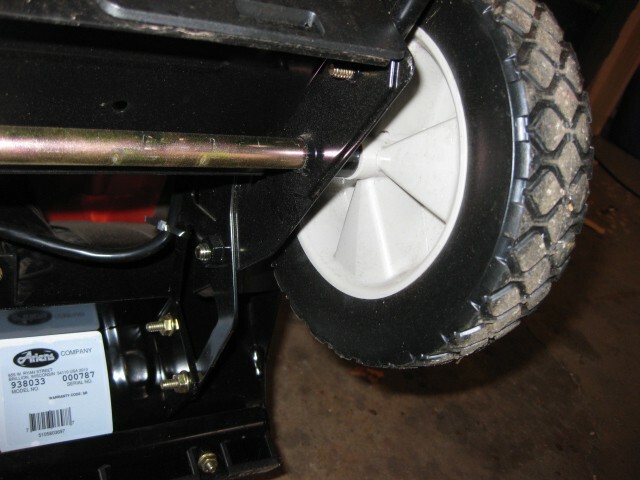 Metal rear bumper and stand: A rod style rear bumper wraps around the rear of the engine and acts as a stand when the snow thrower is tipped back. Why is that important? Instead of a plastic panel like the other brands, the Path-Pro uses a metal wrap around bumper. I like the fact that the bumper protects the engine but the real feature in my mind is the bumper acts as a stand. When you have to tip the snow thrower up to clean out the front or when it tips back in your plow truck it doesn’t allow the handles to touch the ground. This is great because the handles don’t freeze into the snow piled in the back of the truck and it also keeps them from getting damaged when the snow thrower moves around in the truck. 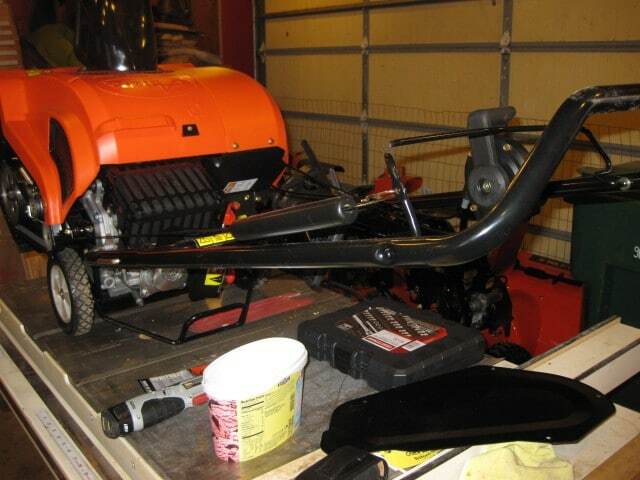 What I don’t like about the bumper is it interferes when I pull the snow thrower up steps. I wish it was mounted just a little higher. Summary: Residential. I feel the Path-Pro was designed well and it will give you years of service. If you like to work on your own equipment this a great choice for you. Not only is it easy to work on, it is easy to use and is less expensive than the comparable residential models. Contractor. 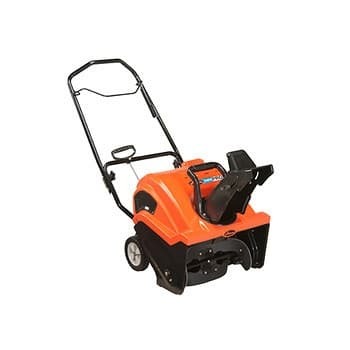 If you want a dependable single stage the new Path-Pro snow thrower is a great choice. It’s easy to work on in the field, rugged, and designed to get the job done quickly. Plus the cost is up to $250 less than a comparable model from a different brand. The following Parts and Accessories are available from your local Ariens dealer. Path-Pro Maintenance Kit. Part Number:73801000 For use on all Ariens® Path-Pro models For use on all Ariens Path-Pro models(includes 1-16 oz. oil, 1 Ultra-Fresh Fuel Stabilizer, 1 Spark Plug, 1 Snow-Jet 4.25 oz.) Home Depot and Build.com do not carry this kit. You will have to go to an Ariens dealer to get it. Protective Floor Mat. 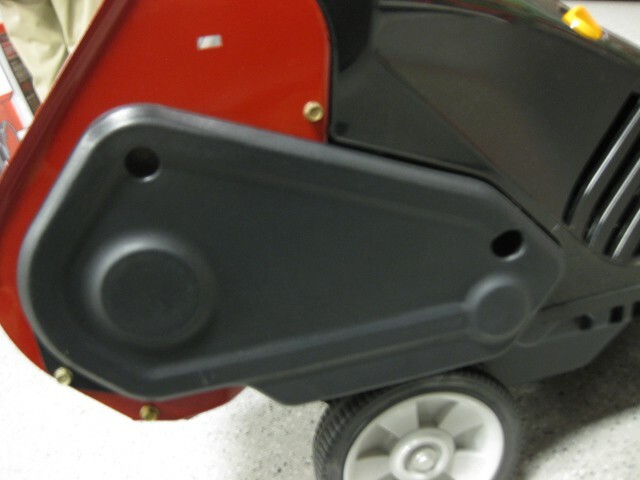 30 x 36″ Designed to provide a protective layer between your Sno-Thro and flooring surface during storage. Single Stage Sno-Thro Cover. This Sno-Thro Cover is made of water-, tear- and abrasion-resistant polyester. The canvas-feel cover fully surrounds compact snow blowers and has an elastic hem that provides a snug fit to further protect your valued machinery from harsh elements. Thanks for getting back to me so quickly. For some reason it wouldn’t let me reply so I made a new comment. I had one more question if you don’t mind. Do you know if this snowblower is okay for tall people? I mean, anything is better than lurching down to shovel manually, but I’m 6’7″ and my back is in serious pain when I mow my lawn (from leaning over). Any advice on that front, or do you know any that are better for tall people? I really only have around $500-$600 or so I can budget for this. I could always rig something I suppose. Hi Ray, I don’t remember how high the handles are. I suggest going to HD and trying it out. The tallest handle that I am aware of in that price range is the Toro SnowMaster. Home Depot will have them to try out also. The 724 series comes without electric start for $650 and with for $750. It is also power-propelled and is very easy to use. The one at my home depot is the ss21E not the ss21EC. Is there a big difference? They look identical. Hi William, The EC model has the remote chute control on the right hand handle. They are identical except for that feature. Home Depot does carry all four models: I used the EC model when it first came out and the control works very well.